Well, here she is! The hour has come! America's favorite famous-baby is finally ready for you to gaze upon her adorable chubbiness and DESPAIR. Someone leaked a still of Beyonce holding Blue Ivy from the HBO documentary Life Is But a Dream, and the internets are abuzzing with face-analysis. Is she more Jay? Or is she Bey? I'm not really sure why you're bothering to ask, because OBVIOUSLY a mad scientist has hit Jay-Z with a shrink ray and he's probably riding around on an ant right now. Somebody get Rick Moranis on the phone. It only took a year, but we finally see that baby ya'll! 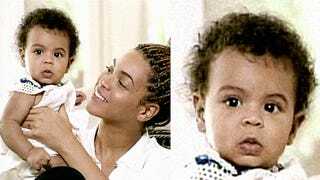 This afternoon Twitter blew up with pics of little 1-year-old Blue Ivy, taken from a still of Beyonce and Jay-z's baby girl in Bey's documentary, Life is But a Dream, which airs on HBO tomorrow. No one would ever doubt who this little cutie's parents are, as her upper half is the spitting image of mommy Baddie Bey and from the nose down she's all the Jigga man. Octo-Mom spent Valentine's Day stripping at a south Florida club, which apparently wasn't demoralizing enough on its own, so Radar took the opportunity to point out that she's gained weight. Classy, guys. Nadya Suleman spent Valentine's Day by taking it almost all off (again), stripping at a packed south Florida nightclub. Octo-Mom was in the first night of a three-night engagement at Ti's in West Palm Beach, reports Gossip Extra. "That's how hard I'm trying to take care of my kids," she told a local radio show just before her striptease. Take a look at pictures from Nadya's show. She's put on a considerable about of weight. Her fans at Ti's didn't seem to care though and showered the mom of 14 with money during her "performance."